Recovering the origins of lenticular galaxies can shed light on the understanding of galaxy and compare them with the kinematics of planetary nebulae (PNe). The PNe and GC data come from the Planetary Nebulae Spectrograph and the SLUGGS Surveys. Through photometric spheroid-disc decomposition and PNe kinematics. we find the probability for a given GC to belong to either the spheroid or the disc of its host galaxy or be rejected from the model. We find that there is no correlation between the components that the GCs are likely to belong to and their colours. Particularly, for NGC 2768, we find that its red GCs display rotation preferentially at inner radii (Re < 1). In the case of the GC system of NGC 3115, we find a group of GCs with similar kinematics that are not likely to belong to either its spheroid or disc. For NGC 7457, we find that 70 per cent of its GCs are likely to belong to the disc. Overall, our results suggest that these galaxies assembled into S0s through different evolutionary paths. Mergers seem to have been very important for NGC 2768 and NGC 3115 while NGC 7457 is more likely to have experienced secular evolution. 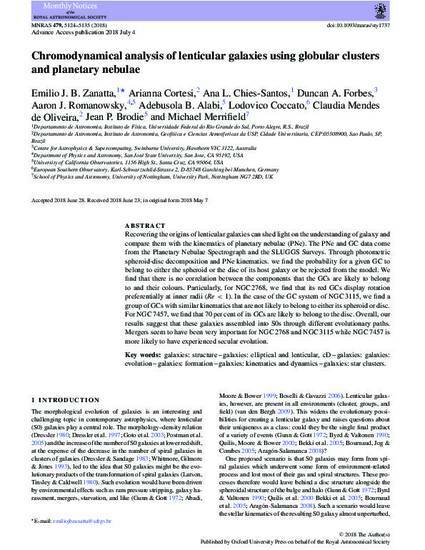 This article was published in Monthly Notices of the Royal Astronomical Society ©: 2018 The Authors. Published by Oxford University Press on behalf of the Royal Astronomical Society. All rights reserved.